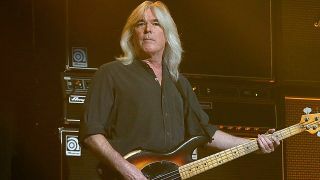 Is bassist Cliff Williams out of retirement and back in AC/DC? The AC/DC rumour mill has been in full swing since August last year. First, estranged members Brian Johnson and Phil Rudd were photographed together outside the Vancouver studio where the band recorded their last three albums. Then, they were snapped with AC/DC’s longtime engineer and mixer Mike Fraser. All had been quiet since then… until last month, when Los Angeles outfit Terrorizer bumped into Johnson at an airport, where the vocalist apparently confirmed his return to the band. But a picture has emerged online from December last year, showing Williams and Johnson together at Vancouver’s Shangri-La Hotel. Could it just be coincidence? We shall see. Last week, US radio host Eddie Trunk reported on his podcast that he had heard from a “very, very, very well-placed” source that AC/DC had completed work on a new album, and that’ll it will contain material recorded by the late Malcolm Young.